Scrolling through Facebook and Instagram today, I’m having a hard time remembering that it is Wednesday and the election is over and Donald Trump is going to be president, because every third post is a picture of a mother and daughter in matching pantsuits casting ballots, or a heartfelt #ImWithHer missive. These were all shared yesterday, before Clinton conceded, and I’m only seeing them now because these platforms operate on social algorithms, meaning a computerized system decided — based on my past interactions — that I would enjoy seeing the mother-daughter pantsuit pics. On any other day, that computer would be absolutely right. Feminism. Pants. Sign me up. Today, however, these posts are just a stinging reminder of a whole lot of dashed hopes for the future. And now that they’re wedged between equally heartfelt posts from mourning friends trying to suss out how the hell we move forward from here, I’d just as soon not see them. Today, that emotional juxtaposition is a little too much for me to bear. Here’s what it looks like on Facebook. On the left-hand side of your computer screen, find “News Feed” under your Favorites column. 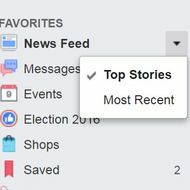 Next, click the small downward arrow to the right of “News Feed.” Select “Most Recent” instead of “Top Stories.” As an added tip, if any one person’s or organization’s posts are really getting to you, the “Hide Post” option in the upper-right-hand corner of each Facebook post is a good way to further control your feed. 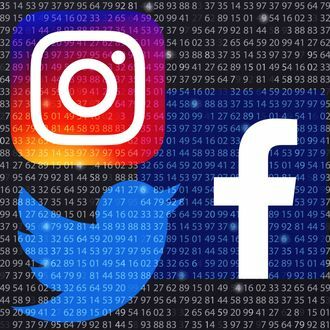 Unfortunately, there is no way to turn off the algorithmic timeline on Instagram — though now might be a great time for the Facebook-owned company to fix that. It’s the least they could do after all their help this election cycle. Until then, maybe just avoid the app until you’re ready.